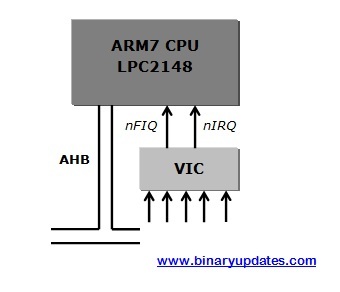 This tutorial is about Interrupt in LPC2148 ARM7 Microcontroller. 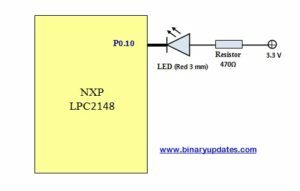 As in our previous post we have programmed timer in LPC2148 to generate precise delay. Here we’ll generate interrupt to perform same task. Throughout this tutorial series we’ll use interrupt with several peripherals of LPC2148 ARM7. Before we proceed any further let’s refresh the concept of interrupt and then we’ll have a look at timer interrupt in LPC2148. 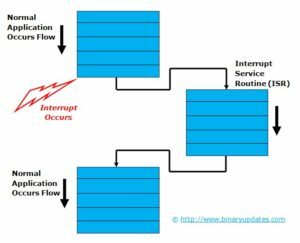 What is Interrupt or ISR? In general, an Interrupt is a signal from device attached to a computer or from a program within controller that causes main program to stop and figure out what to do next. ISR (Interrupt Service Routine) is executed when an interrupt occurs. A section of a program that takes control when an interrupt is received and perform the operations required to service the interrupt. Whenever any device needs service of microcontroller, the device notifies the microcontroller by sending interrupt signal. Upon receiving an interrupt signal, the microcontroller stops or interrupt main program flow and saves the address of the next instruction (PC) on the stack pointer (SP). It jumps to a fixed location in memory, called interrupt vector table that hold the address of the ISR (Interrupt Service Routine). Each interrupt has its own ISR. The microcontroller gets the address of the ISR from the interrupt vector table and jump to it. Upon executing last instruction in Interrupt Service Routine the microcontroller returns to the place where it left off or interrupted previously. And first, it gets the program counter (PC) address from the stack pointer by popping the top two bytes of the stack into the PC. Then it starts to execute from that address and continue executing main program. The AMBA (Advance High Performance Bus) is used for interface vectored interrupt controller to the ARM7 Core (LPC2148) in our case. Non-Vectored IRQ Non-Vectored Request: Non Vectored IRQ has lowest priority. The VIC is capable of handling 16 peripherals as a vectored interrupt and at least one as an FIQ Interrupt. If in case there are more than 17 interrupt sources on chip, any extra interrupt can be serviced as a Non-Vectored Interrupt. 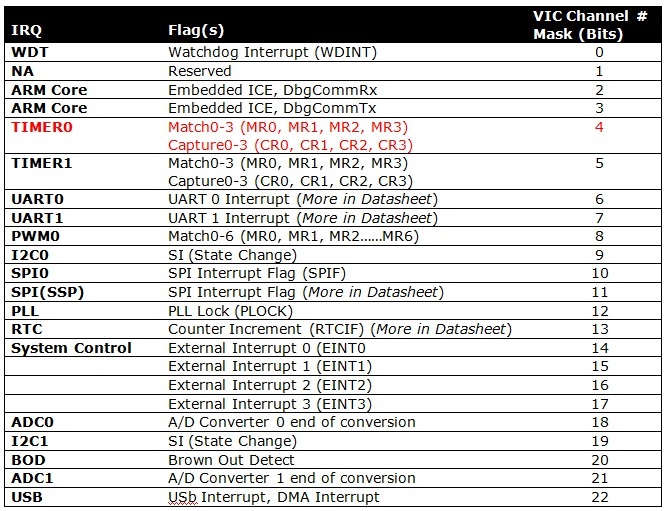 IMPORTANT: Vectored interrupt controller has 23-vectored interrupt slot out of which 16 slots are used in LPC2148. Every slot has set of registers like control & address register. If any of these slot used then these register should be programmed. Slot 0 will have the highest priority and slot 15 will have lowest priority. Example Project: To use interrupt in our example project. We’ll use Timer to show usage of interrupt in LPC2148 ARM7 Microcontroller. As we’ve seen Timer in our previous post. I believe our brain is still warm with it. To keep simplicity in our example project we’ll blink LED when interrupt is generated after every 0.5 Sec. Let’s break down a code into pieces for detail explanation. We’ll try to understand what each line stands for. You can see, we have only added one extra function into previous timer example program. In this function we have configured Timer0 and Interrupt feature. As we’ll be running PCLK at 60 MHz, we’ve to set prescale value to be 60000-1= 59999 into T0PR register so that after every 60000 clock cycle we increment T0TC register(60000 clock cycle at 60 MHz allows to generate 1 ms resolution). Now setting 500-1 = 499 into T0MR0 register which trigger interrupt at every 500 milliseconds. We also have to set bit 0 and 1 into T0MCR register to interrupt and reset Timer Counter Register (TC) in Match Register (MR0). VICVectAddr4 = (unsigned)timer0ISR, used to setup pointer to interrupt service routine (In our case timer0ISR). Basically Vector Address Register store the address of the function i.e. ISR and used to assign or enable vector IRQ slot. We also have to enable slot and set priority for interrupt. VICVectCntl4=(1<<5) | 4, here setting bit 5 in Vector Control Register4 will enable slot which has assigned by VICVectCntl4 i.e. here in this case it is ‘4’. Writing decimal 4 would set interrupt source i.e. Timer0 as an interrupt. After setting all interrupt related registers we have to enable Timer0 interrupt by setting VICVectIntEnable = (1<<4) and Reset Timer0 by setting bit 1 to become HIGH into T0TCR register. This is an Interrupt Service Routine (ISR). As we have used Timer0 as a source of interrupt. An MR0 match event which raises an IRQ (Interrupt ReQuest). 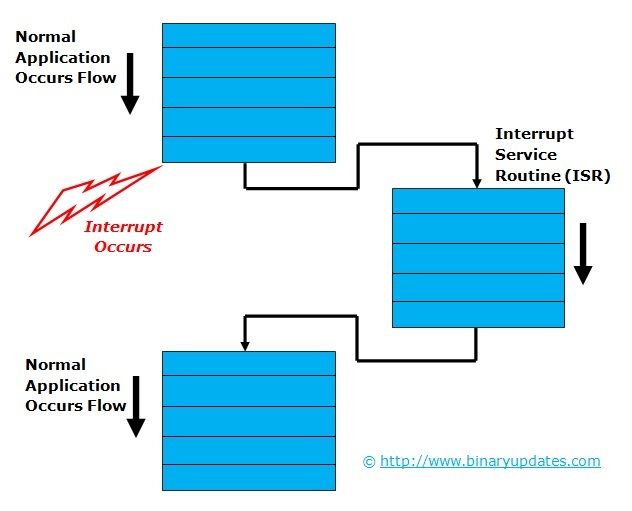 Because we know Timer 0 is source of interrupt so read current value in Timer0’s Interrupt Register i.e. T0IR. When MR0 match event occurs we’ll toggle LED connected to Pin P0.10. We also have to make sure to clear interrupt flag ‘T0IR = readVal’ and call for end of interrupt by setting VICVectAddr= 0x0).